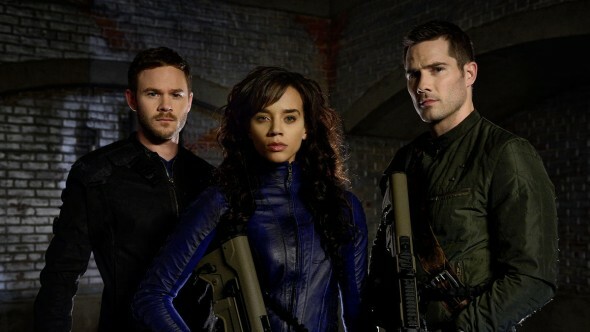 Performers include: Aaron Ashmore, Luke Macfarlane, and Hannah John-Kamen. This science fiction TV series follows a fun-loving, hard living trio of interplanetary bounty hunters sworn to remain impartial as they chase deadly warrants throughout the Quad, a distant system on the brink of a bloody, multiplanetary class war. Dutch (Hannah John-Kamen) is a gorgeous, complicated, and deadly flirt. Bold and fun-loving on the surface, she has a unique gift for earning people’s trust and respect — regardless of their class. But under her banter and protective flirtations, there is pain, maturity, and a deep solemnity. She has always withheld a part of herself — a history of which she is deeply ashamed. On top of being a born soldier, D’avin (Luke Macfarlane) is handsome, uber-masculine, sarcastic, and incredibly loyal. He dreamed of enlisting since boyhood, and his hard-won expertise in tactics, maneuvers and hand-to-hand combat make him a vital asset to the Killjoy team. John Jaqobis (Aaron Ashmore) is dyslexic with learning and reading disabilities and was labeled as “stupid” all of his life. But make no mistake, he is not. Give him any mech, any tech, and he can fix-it-build-it-fly it. Just don’t ask him to read the instructions — or to believe that he’s actually intelligent. He has some self-esteem issues but one thing he’s completely sure of is his devotion to his fellow teammates. What do you think? Do you like the Killjoys TV show? Do you think it should be ending with season five? I love the show. I really want it to go on. I never miss Killjoys. Good action, humor and production, but sometimes confusing. Keep it going. I love Kill Joys. Please do not end it for a few more years. It is great. Please renew this awesome show! !